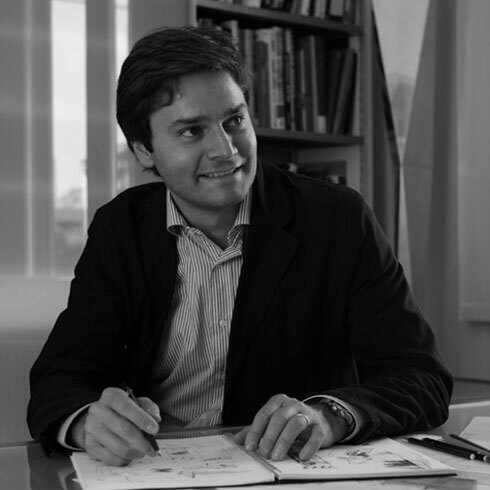 Born in 1973, Marco Acerbis graduates in architecture from Politecnico di Milano in 1998. From 1997 to 2004 he lives in London where he works with Lord Norman Foster's Studio. He then becomes Project Architect for Capital City Academy, a 250 meter long High School building for 1400 students which was opened by Tony Blair. Fascinated by designing at very different scales he quickly moves on to explore with a constant cross over of skills, ideas, tools and technologies all sorts of subjects to achieve a globally designed space. The Vertigo floor lamp, designed for Fontana Arte in 2004, was immediately acknowledged as a best seller and an icon of our time and is now included in Vitra Design Museum permanent collection. Prius door handle designed for Colombo Design wins a Special Mention at XXI Compasso d'Oro ADI. Kloe Armchair designed for Desalto wins the Red Dot Design Award 2009.